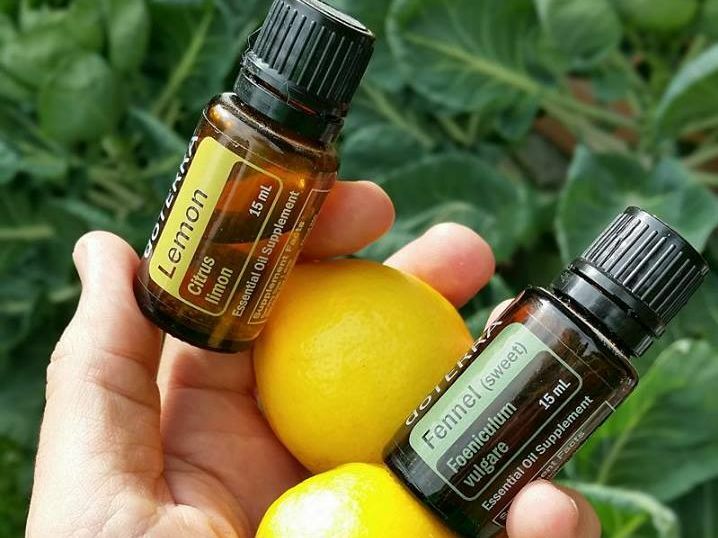 At the moment I’m having one drop each of lemon and fennel essential oil, in a glass of filtered water every day. Why am I doing this? Well, let me explain. While essential oil may be thought of as something to apply to the skin (sometimes with a carrier), or to diffuse into the air, it’s also very beneficial to consume, but not all essential oil is for internal use. These oils are volatile liquids distilled from plants, and parts of plants like seeds, bark, leaves, stems, roots, flowers, fruits, etc. They embody the regenerating, protective and immune-strengthening properties of plants. They have the potential to affect every cell of your body within 20 minutes, and then be metabolized like other nutrients. Plants are very healing for us and I think one of the more popular plants that has become known recently, mainly for its cancer fighting properties, is cannabidiol (aka CBD) from the cannabis plant. CBD oil is not just beneficial for fighting cancer, but can help with other areas of our health, such as pain relief, combating anxiety, and reducing the risk of diabetes. Cannabidiol can be delivered via capsules, dried cannabis, or as a prescription liquid solution. The cannabis plant is just one plant of so many—imagine the variety of health benefits available to us, based on the variety of plants in the world. The reason essential oil is so potent, and powerful, is because of the concentration and process it is made. For example, lemon essential oil is obtained from cold expressed rind, requiring around 3,000 lemons to produce a kilogram (1.2 pounds) of oil. Historically lemons have been used to fight food poisoning, malaria and typhoid epidemics. Christopher Columbus’ crew consumed lemons during their trip to America to help combat scurvy. In France lemon has been used as an air disinfectant, and to help with anemia, asthma, cold, fevers, germicide, gout, heartburn, intestinal parasites, red blood cell formation, rheumatism, throat infections, ureter infections, varicose veins, water purification and white blood cell formation. But it doesn’t just stop there, other primary uses of lemon essential oil can help with anxiety, atherosclerosis, bites and stings, regulating blood pressure, brain injuries, cold sores, concentration, constipation, depression, digestion, dry throats, dysentery, energy levels including exhaustion, flu, grief/sorrow, hangovers, kidney stones, overeating, relaxation, stress, and varicose veins. It can also help with aging, soothing broken capillaries, dissolving cellulite, clarity of thought, debility, digestive problems, gallstones, hair (cleansing), liver deficiencies in children, memory improvement, strengthening nails, nervous conditions, and promoting a sense of well-being. I won’t get into the details on fennel as it will make this post far too long, but you can understand that there are a long list of health benefits from each plant in use. It’s very important to seek and obtain the purest possible essential oil, otherwise you won’t get the full health benefits and may run into some negative situations based on what else may be added to dilute the oils. So make sure the oil you go with has been properly scientifically tested to meet therapeutic standards, even if you read a label that says 100% pure, you still should do some research on the brand. This website is helpful to learn about essential oil testing and sourcing, https://sourcetoyou.com/. If you’d like to learn more about your health, see my article here, Why do we get sick? | Our Psychological Foundation & Immune System.